The day before the Polish Team Championship we had a WTC training day, one of many so far. We made 4 teams of 5 players and played a 2 Rounds boot camp. 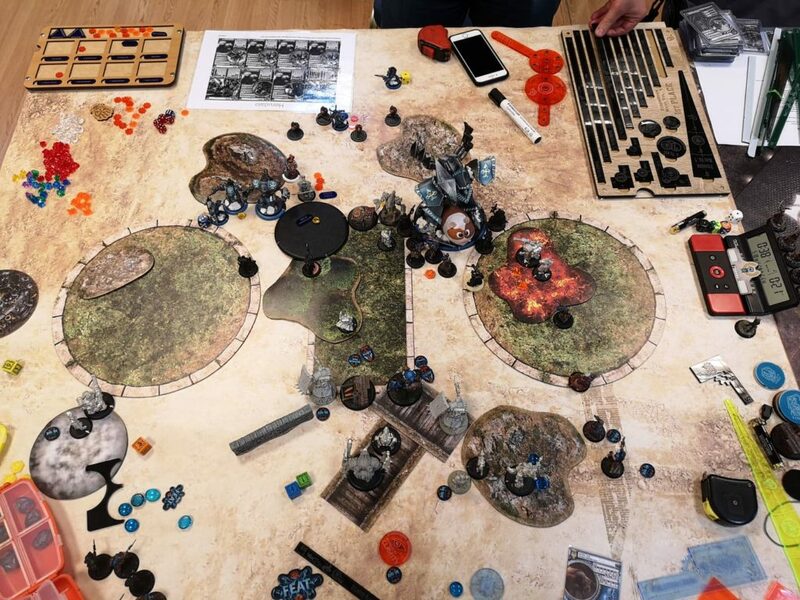 In the first round we played against southern Poland team and I got to play against Michał and his lovely Legion army. First of all, I would like to apologise, but my reports from that day and the whole weekend of Polish Team Championship will not be as detailed as they usually are. The reason for that is pretty simple – I lost all of my photos from that day along with my phone memory wipe. My phone died the next day and the photos weren’t uploaded to the cloud… Fortunately I have sent couple of photos to my friends via mesenger and I was able to recover at least 2 or 3 of them. Happily, I played 2 games with Michał that weekend, and luckily he was also taking photos. I will focus on giving my point of view and expanding conclusions, since Michał did a really good job in reporting the game! Please find our lists below. We played The Pit II. I was aware of that what Michał’s list is capable of doing and I knew that keeping my crucial models safe from Golab will be the issue here. Michał could just hide his bird behind the building and threaten 11″ trample followed by attacks with Finisher. He also had that sweet spots for Maws. What I was aware of, but I had to see to know how painful it could be, was his ability to create a cloud wall by killing 2 Tentacles with Thagrosh melee attacks and turning them into dust – a 3″ AoE cloud effect. Fortunately, I wasn’t affected by his -2 STR aura, since I prefer rather to zap, than to punch. Another thing worth mentioning before I go to conclusions is how useful Magnetic Field is in this match up. Thanks to that spells most of my warjacks were safe from getting pulled by Tentacle. I had to keep an eye on Junior’s Firefly and Caine’s Ace, as they are not part of Nemo’s battle group. I needed to find a proper moment to use my feat and roll good on electro leaps. I knew positioning correctly will be time consuming. Michał can easily trade Golab for my Thead, since he can return him with his feat. On paper, it looks like an easy match up, but in reality it all depends on the terrain setting and clouds placement. Please find a reference photo from our Deployment phase below. We played till the very last seconds and the fate of the game decided in the last turn. Only if one last Warmonger would die in the zone we would tie on scenario and count the army points. Alternatively, Michał could also kill Nemo over 2 turns (what we realised after the game), as I didn’t have enough time to even run with Nemo. Michał very wisely took advantage of that building in the middle of the board. Additionally, he kept his Blight Bringer far back, so I couldn’t shoot him off with my feat. I believe his collossal is the best target to get rid of under my feat. Shooting at him would also mean that many models around him would die. Unfortunately, I had to commit a lot of models to kill Golab, what basically ment that Blight Bringer will be left alive. Throughout the game I have managed to keep my Thead safe from Golab. It definitely costed me a lot of time. Time that I didn’t have in the last turns. For sure I could have saved more of it in first 2 rounds of the game. 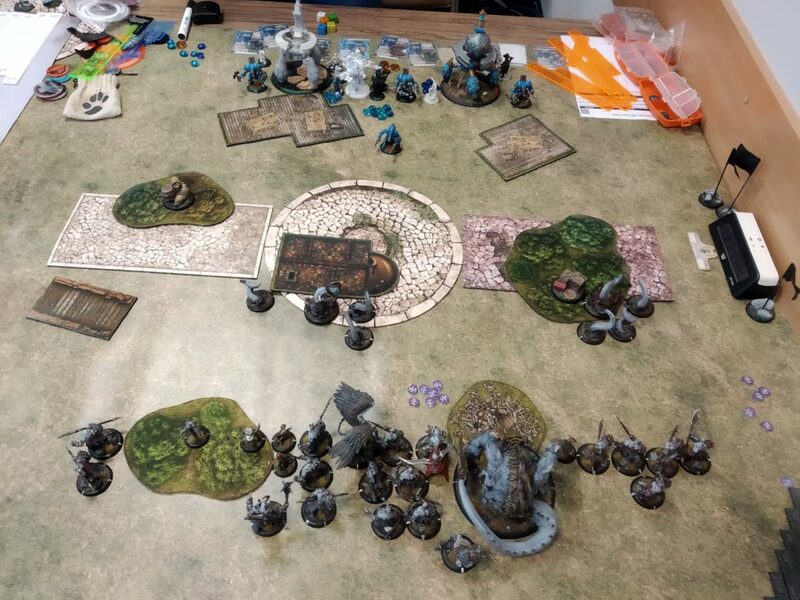 In the second game we played against another team from southern Poland and I asked to be paired against Marcin Mycek and his double Judicators list. I believed that whoever would get paired against him would lose and my friends had better match ups against other players from that team. Unfortunately, since my photos got ereased, I have only the one I sent to my friend vis messenger. The game didn’t last long as I was unable to kill any of the Judicators. One of them stayed untouched, whereas the other survived on couple of boxes. Additionall ARM buff is a thing against that many low powered attacks and that combined with Kreoss1 obvious pop and drop tactics resulted in me losing that game. The only moment that could change the fate of this game was when I managed to snipe Tristan with my Express team with (trully) Desperate Pace and my feat movement. Unfortunately, he had 1 foc point left and survived. His Judicator was outside of his control zone, but those collossals can work efficiently without any focus points. My friends watching the game believed that Tristan is in my assault range, but after veryfing photos (still existing back then) we agreed that he was outside of the threat range. In this match up, only protectorate player’s mistakes can result in me winning the game. All in all I was quite sure I would lose it but I tried to find the good angles. Since Marcin commited only that one and I didn’t manage to kill the solo it was a lost cause.